Dry hopped with Amarillo®, this American rye pale ale is perfect for summer enjoyment. Make a gauge to measure low pressures and a handy hanger for dry hopping in the keg. How to avoid the last major hurdle to extending your beer’s shelf life. When you’ve just weed-whacked the back forty, you need a beer that tastes great and quenches your thirst. Recipes and step-by-step instructions for light, dry, balanced summer beers that finish clean. 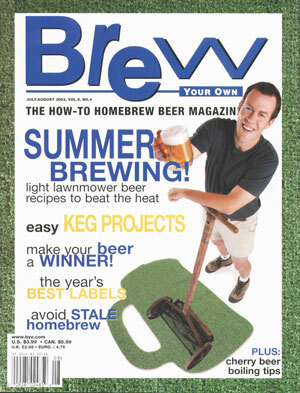 Tips, techniques and award-winning advice on entering your homebrew in a competition (and bringing home the hardware!). Six quick competition tricks, best-bet beer styles and what the judges look for. Plus: Florida’s heavy-medal man explains ten more ways to put your beers on the podium.